A brief recap for those of you who are new to this project or blog. My daughter Piper and I are exploring Korean Skin Care and documenting it here. If you are interested in how we got to this point, I recommend checking out these posts. Korean Skin Care Project, Korean Multi-Step Routine. 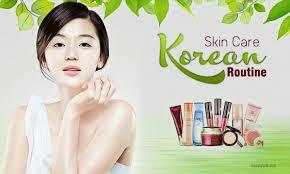 In this installment we are going to cover one of the basic tenets of K-beauty, cleansing. 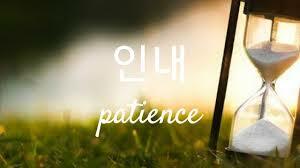 Koreans are obsessed with having scrupulously clean skin. What makes their approach different from what we practice in the US is they use two different types of products to wash their faces, this process is cleverly referred to as, the double cleanse. As you have already surmised, the double cleanse has two steps, first breaking down and dissolving makeup and grime with an oil cleanser, then cleaning the residue and adding moisture with the foam, or water based cleanser. Here’s the catch, you don’t have to use oil or foam if you don’t like them, there are a million cleansing products out there for cleansing, you just need to find two that work for your skin. The first step of the double cleanse accomplishes a variety of things. First, it breaks down makeup and dirt. Second, it adds moisture and hydration to the skin. Third, the massaging action stimulates circulation and the lymphatic system to brighten the complexion and reduce puffiness. 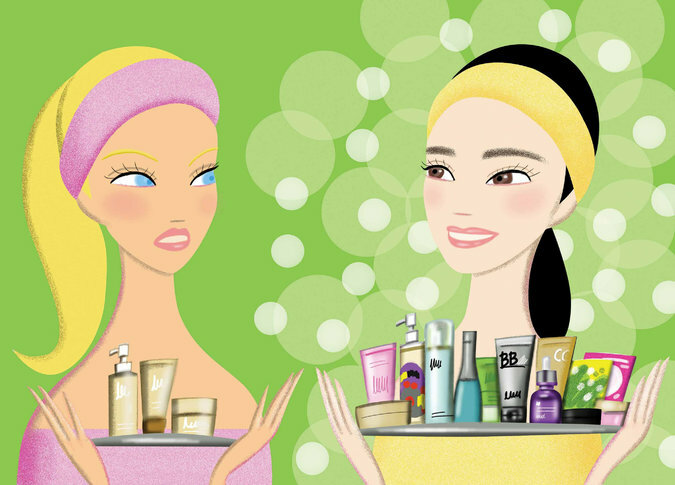 For this step there are two basic categories of cleansers, oils and balms. I am a balm girl, so lets start with those. Balm cleansers are soft solids and come in a jar, much like coconut oil. The cleanser I use is Clean it Zero by Banila Co. and it is my favorite product in the routine. I use the original formula in the pink jar, they also have a version for acne prone (purple jar) and dry (yellow jar) skin. Banila Co. Clean It Zero is in my opinion, and about a million others, the best of the balm cleansers. You scoop out a small amount, with the adorable little spoon they give you, gently rub it onto your dry skin and it immediately emulsifies into a light oil which dissolves makeup and dirt. It rinses off clean and leaves your skin soft with absolutely no oily residue. Clean it Zero is a cult favorite in the K-beauty world and I can see why. Two other balm cleansers I found are Enature Moringa Cleansing Balm and Aromatica Orange Cleansing Sherbert which may be worth giving a try, but I plan on sticking with my little pink and white tub of amazingness for the foreseeable future. You can also use oil cleansers for the first step. Piper originally used The Face Shop Rice Water Bright Cleansing Oil. It is a light, watery oil in a pump dispenser. However, after a week she started to break out pretty severely and we think this may have been the culprit. I tried this oil a few times and also got the random pimple afterwards, not exactly proof positive, but enough for us. She has since shifted to Clean It Zero (purify edition) and has had no problems. If oil cleansers intrigue you, here are a couple to try: Klairs Gentle Black Deep Cleansing Oil and Innisfree Apple Juicy Cleansing Oil. The second product of the double cleanse is the foam cleanser. Once you have rinsed off the oil/balm and before you dry your face, you apply your second cleanser to wash away any left over makeup, dirt or oils. For this step I use the Mizon Snail Repairing Foam Cleanser. This is another great product. I know I sound evangelistic, but I do really love these two products, we will get to some that were underwhelming, but not these. The amazing thing about this cleanser is how little you need to create the thickest, silkiest foam you have ever seen. Also, I know the snail thing is a little weird, but there is no hint of bad smell or sliminess in this cleanser. It rinses off clean and your skin feels happy and plump. At $7 a tube (which will probably last 3 months) this stuff is a must try. Piper uses, and likes, Cosrx Low PH Good Morning Cleanser which is probably the most consistently recommended product I researched. It doesn’t foam up as luxuriously as the Mizon product, but she has had good luck with it and would recommend it for someone who has sensitive or acne-prone skin. A few other cleansers I am interested in trying are Klavuu Pearlization Revitalizing Cleansing Foam and Hada Labo Gokujyun Hyaluronic Acid Cleansing Foam, which is a Japanese product but has been recommended in a lot of my research. However, given how much I love the Mizon product, and how little of it I use each day, I don’t know if I will want, or need, to try anything else in the next few months. So the take away from step one, the double cleanse, is that it is definitely well worth trying. 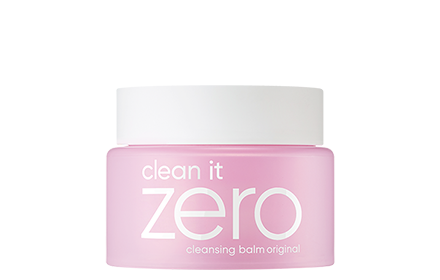 If you are not ready to commit to the whole multi-step routine, I would recommend buying a jar of the Clean it Zero balm, and one of the foam cleansers and just giving this step a try. You will see an almost immediate change in how your skin responds which may inspire you to try some of the other steps. Wear a wide terry cloth headband and tie your hair back if it is long. If you get the oil cleanser in your hairline, it’s going to look greasy unless you wash your hair. Use warm water, cool water will not emulsify the balm cleanser very well. Try putting the balm cleanser on while your shower water heats up, then take the foam cleanser in the shower with you. I know a lot of sources tell you not to wash your face in the shower, but that’s what us busy people do. Leave your face wet after you rinse off the oil cleanser, just blot your neck to keep the water from running down your shirt, then rub the foam cleanser onto your wet face. Have a clean, fluffy towel within arm’s reach, otherwise you are feeling around blind for a towel which is not cool. Also, designate a towel as your face towel keep it separate and wash it often, you don’t want to use the same towel people wipe their hands on to dry your clean face. Next Up: Step Two- Toner, this is nothing like the step we all skip in the US. As we established in my last post, Stitch Fix BTS Concert Edition my daughter and I are going on a road trip to Hamilton, Ontario to see the sensation sweeping the nation, K-Pop band, BTS, this week. What does a grown woman wear to such an event? I have no idea, this is why I turned to my stylist at Stitch Fix for help. It’s been awhile since I posted a review of one of my Fixes, mostly because I’ve been busy, but also because I had some dud Fixes and was not really excited to share them. 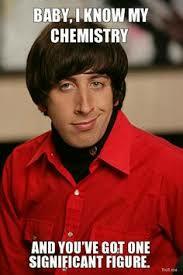 That all changed when Stephanie came into my life. She is the stylist assigned to my case after I had two 0 for 5 fixes in a row, and she is amazing. So when I put out the bat signal for help with what to wear to this concert, I was fairly confident she would know what to do. Like any great super-hero, she came through in a crisis. Let’s take a look at the outfit she put together. Let’s start with the jacket because it is amazing. The front is a butter-soft leather, but what you can’t see is that the back is a light weight stretchy material so it molds to your body and moves with you. 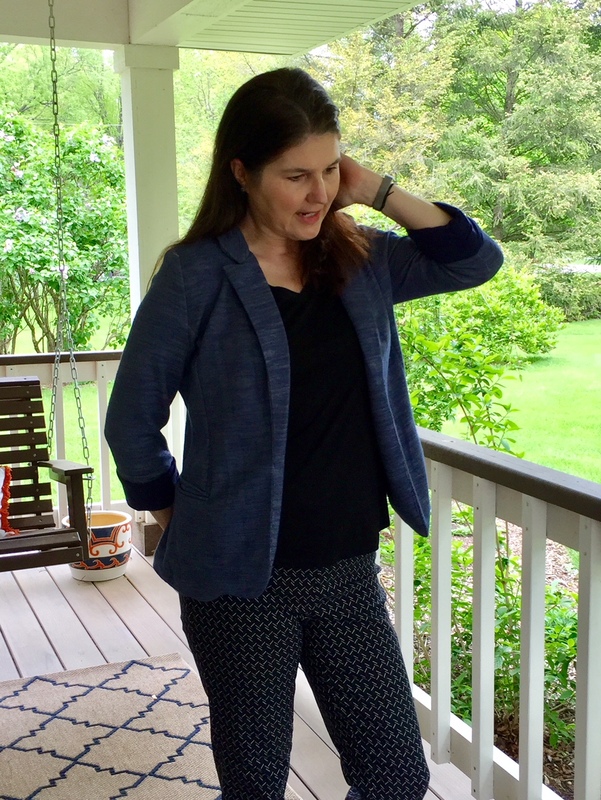 I didn’t think Stitch Fix could send a cuter jacket than the one in Piper’s fix. I might have been wrong. Let’s talk about this blouse. That color, Gorgeous! I am a total sucker for rich burgundy tones so this one made my heart sing. The cut is perfect, the cute side-tie keeps it from being too long and looking like a smock. It also allows you to leave it un-tucked, because frankly who wants to deal with a tucked=in shirt at a concert? No-one, that’s who. The jeans fit perfectly and have a dark rinse color that goes with everything. They are also a great length, so often skinny jeans are either too short, and your ankles are exposed, or too long and you have a big puddle of fabric around your ankles. Finally, I am not really a jewelry person, but this necklace adds that little bit of flair that makes this an outfit. I love it. The other awesome top she sent for my consideration was this beautiful cobalt blue, crochet detail blouse. I don’t think the neckline of this one goes as well with the jacket as the other top, but otherwise, I really like everything about it. What a great color. Oddly enough this is not a color I wear a lot, but whenever I do people compliment me on it, which I of course respond awkwardly to because, as we have established, I got no style game. In fact, I wore this blouse to work yesterday and 3 people commented on the color, so there you go, another win. 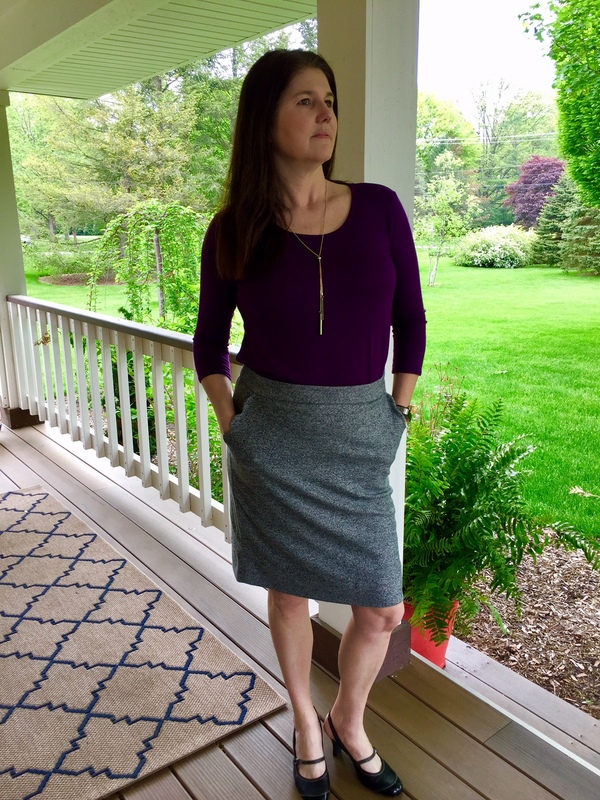 What’s Stitch Fix and how can I get some? Stitch Fix is a subscription styling service, that, for a reasonable fee, sends you clothing based on a profile you create. Purchase an item and the styling fee ($20) is credited towards your balance. You can also get a $25 credit if you use a referral link when you set up your profile. Follow the link below and fill out your profile. When you are ready to order your first Fix, you will have a $25 credit waiting for you on your account. Yep, honest to goodness free money. 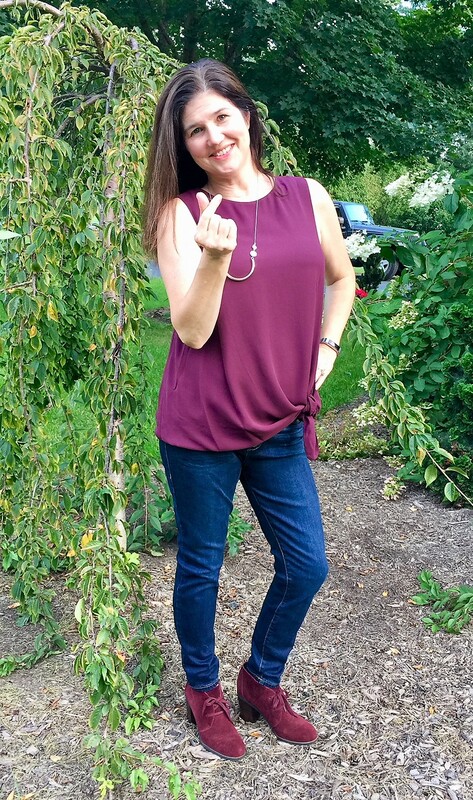 After you use that link and set up your profile, click on over to some of these Stitch Fix Reviews to see what you are in store for. 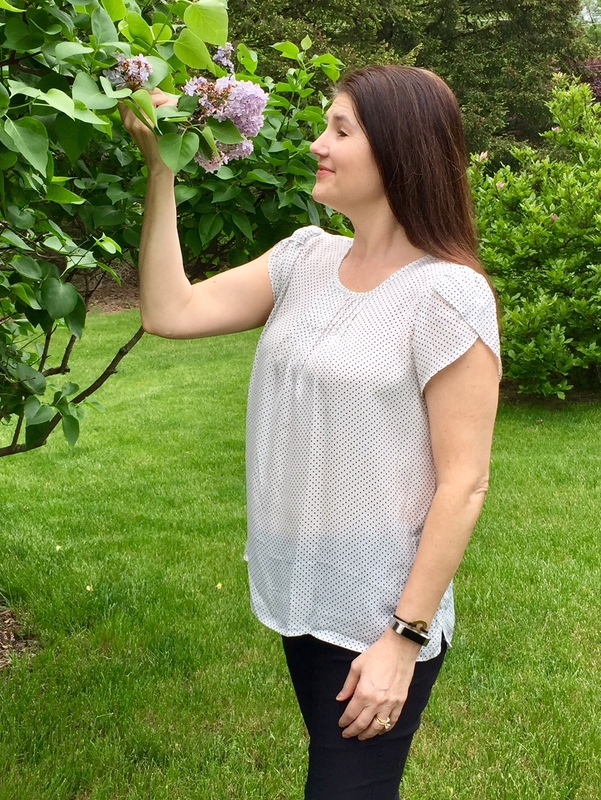 Back To School Stitch Fix, Teen Stitch Fix, July Stitch Fix Review, and May Stitch Fix Review. It’s a great feeling to come home and see your new Stitch Fix box sitting on the porch. Especially when you forgot it was coming. Bonus!! This is my fourth installment of five wardrobe items, specifically chosen just for me and delivered to my door. Let’s see what I got. 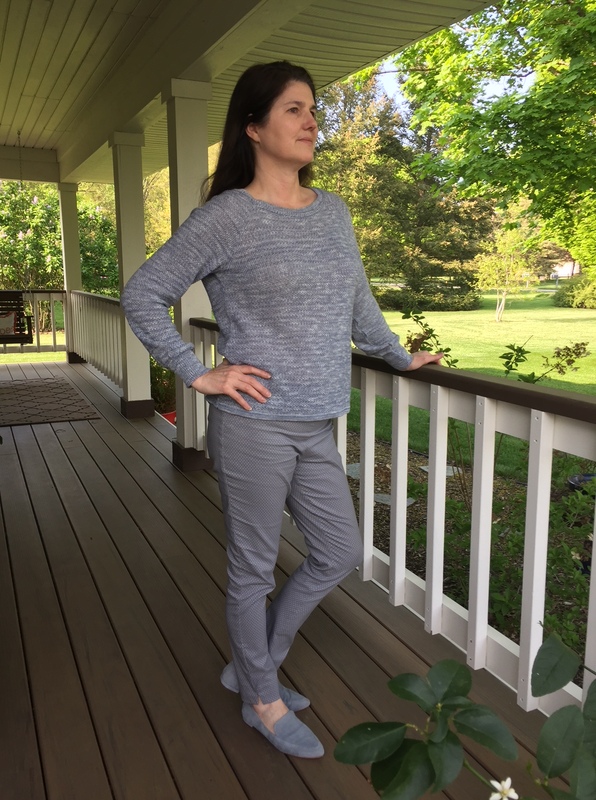 What’s the deal with this Stitch Fix thing you keep rambling on about? 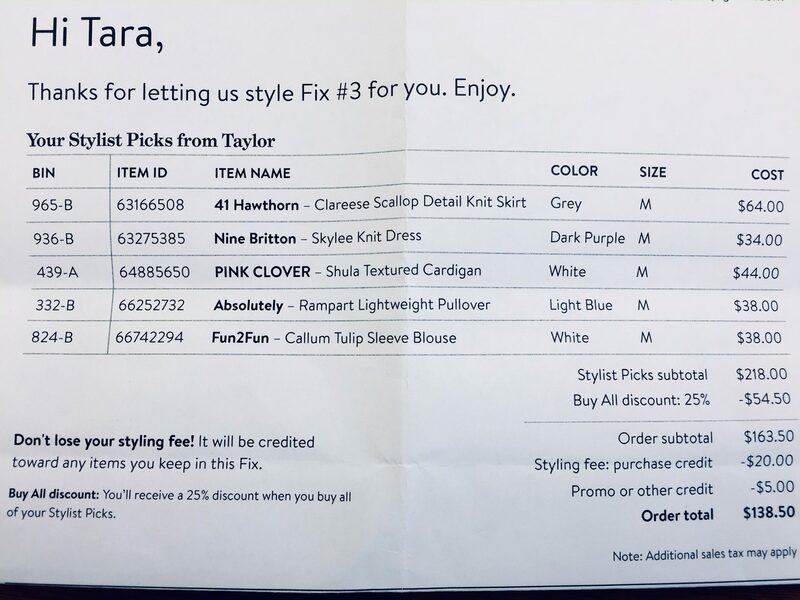 If you have no idea what I am talking about, Stitch Fix is a subscription styling service, that, for a reasonable fee, sends you items based on a profile you create. Purchase an item and the styling fee ($20) is credited towards your balance. You can get a $25 credit if you use a referral link when you set up your profile. If you are interested, just follow the link below and fill out your profile. When you are ready to order your first Fix, you will have a $25 credit waiting for you on your account. Since my Fixes have been so on point, I requested more of the same. Unfortunately, I don’t think I was truly in the mood for “the same” when I opened this box. On first glance, I saw a sweater, some tops and a dress. My immediate impression was that I loved the dress, disliked the sweater and was unmoved by the tops. The first piece was this really comfy knit top. It fit really well, often these kinds of cross-front tops need to be pinned, but this was perfect. The fabric was light and stretchy, and it was super comfortable. The price was a little high for what it was, but it’s a great piece. Not a great photo of the top, but isn’t Odin the cutest? Next was this striped skirt. Even though I have fairly narrow hips, the white vertical stripe managed to find it’s way to the widest part of my body. It’s a nice skirt, light weight, fully lined; but, it is the rare body type that can pull off bold horizontal stripes. I know that vertical side stripe is designed to minimize the width, but it is not fooling anyone. I love sweaters, even in the summer. The day I opened this box it was 95 degrees out with 10,000% humidity, probably not the best day to judge a sweater. So this sweater started out in a hole, the color did not help it at all, and it totally gave off a dowdy vibe. Strike Three. The cardigan is not awesome, but Winston the Corgi has awesome on lock down! The one piece in the box I was sure I would not like turned out to be the one piece I actually loved. This top looked gigantic when I held it up, but when I put it on I was pleasantly surprised. The only issue I had with it was the length in the back, it gave it an art smock feel that I did not think would work well in the office. I saved the dress for last because just coming out of the box this thing made my heart sing. It’s a gorgeous navy blue, stretchy fabric, v-neckline (my personal fave) and be still my heart, POCKETS! I was smitten. Unfortunately that style came at the cost of breathing. You see this dress hit me in the widest part of my rib cage, and even though it was stretchy, there was not enough give to make comfortable breathing possible. Also, because it has a full skirt and is high-waisted, if you could see me from the side it has a tenting effect that makes me look like I am trying to hide a pregnancy. Heartbreaking. But alas, I just really wasn’t into any of these items. I went back and forth trying to convince myself to keep the white blouse and the navy top, but in the end I realized I have a lot of white tops, and this one was not really office appropriate. The blue top was lovely, but it would have had to get in line because I have several navy blue tops as well. This is my first time striking out completely, but I’m pretty sure it happens to everyone. I am actually proud of myself that I resisted the urge to hang on to items I probably wouldn’t have worn much. Can’t wait to get my Fix on next month. 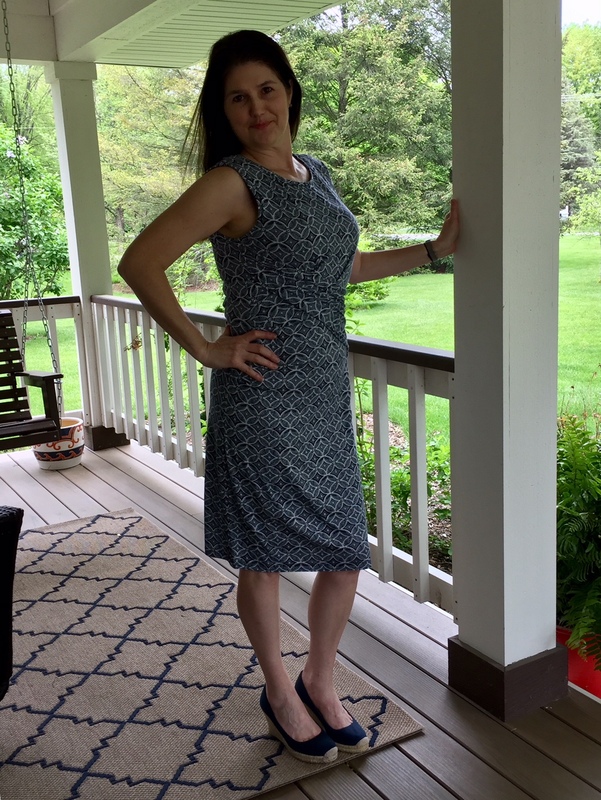 Another Stitch Fix Convert. Fix #1 and #2. 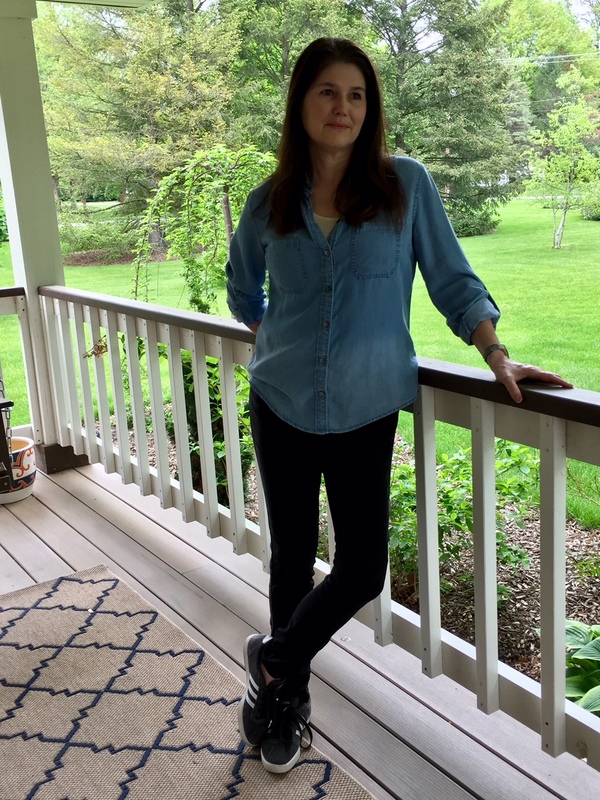 Yes, it’s true I have become a Stitch Fix evangelical. I realized a few months back that I have no idea how to update my wardrobe anymore, and frankly at this point, I am just not motivated enough to learn. 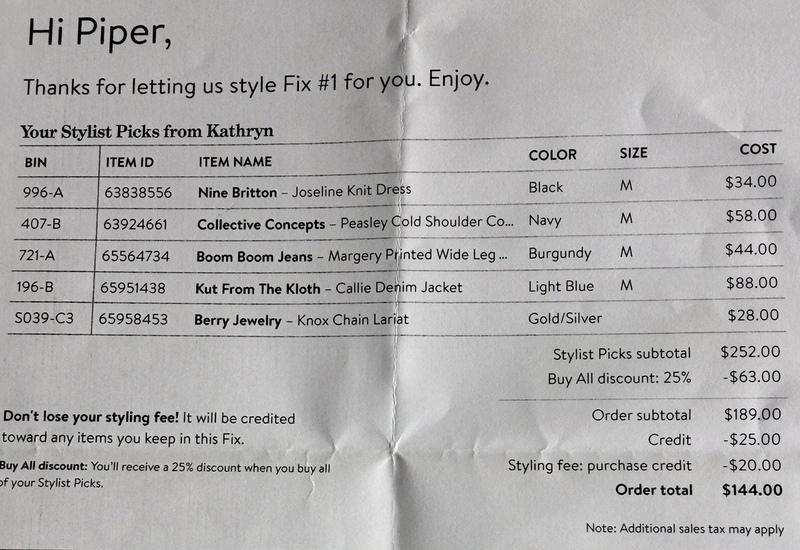 So after hearing from everyone that I should check out Stitch Fix, I gave it a try. The following is my experience. Just click through the link and set up your profile. Whenever you are ready, you can schedule your first Fix. Don’t be a fool like me and just sign up without a referral and pay full price, you are literally passing up $25 in savings. Yes, I did that. With my first Fix, I only kept one of the 5 pieces. I actually liked 4 items, however, I already have lots of black pants, and even though the ones they sent were amazing, I can’t justify spending $88.00 on another pair. They also sent a jacket and a blouse that were cute, but pricey, and I could not see myself wearing them enough to warrant spending that kind of cash. We will not speak of the sweater, it was so wrong for me that I have chosen to block it from my memory. I kept this Mollee knit dress by Kut from the Kloth ($88.00), and sent the rest packing. This dress is so soft and comfortable. It’s lined so it keeps it’s shape and the blue and white print looks great under a jacket or sweater. I see this dress and I doing great things together in the future. Realizing a lot of my resistance was to the prices not the clothes I adjusted my budget to the “cheaper the better” option. I think they should rename this option, because it makes you feel a little bad about yourself, which is why I initially went with a higher budget. Crazy right? Why should I care if some stylist I don’t know thinks I’m cheap. Fix number two was a little better. Again, I really liked 4 of the items and the 5th wasn’t bad, I am just not inclined to spend $55 on a striped knit shirt that I could find at TJ Maxx for $19.99. This time I kept a super comfortable unstructured blazer and a really nice quality chambray shirt. The jacket is called the Asa knit blazer by Skies are Blue ($64.00) and it is like wearing a hug. The sleeves are pre-rolled and sewn into place, so no adjusting them all day. It has a really nice weight even though it is unlined, and the color blends nicely with other blue items which is not always the case when it come to blue. The “Betty” shirt is by Liverpool ($64.00) and it is simply perfect. You have to know for me to pay that kind of price for a shirt, something has to be up. All I can say is if you could put this shirt on and feel how nice the fabric is, you would be smitten too. I have already worn this shirt at least 8 times. There was also a white blouse (Clearwater Mixed Material by 41 Hawthorn $58.00) that I loved the looks of in the box, but once I got it on, it just did not fit me well. Probably because I am short-waisted, and it hung really weird on me. The pants fit me great, but they were a cropped style and that is just not my jam. I can never find shoes that look right with cropped pants so I just steer clear. Once again, I thought the prices in this Fix were too high (that $25 discount would have been nice) but I was satisfied with the items. I sent a note to my stylist again asking for them to please be more mindful of the prices next time, so we will see what happens. I will keep you posted. 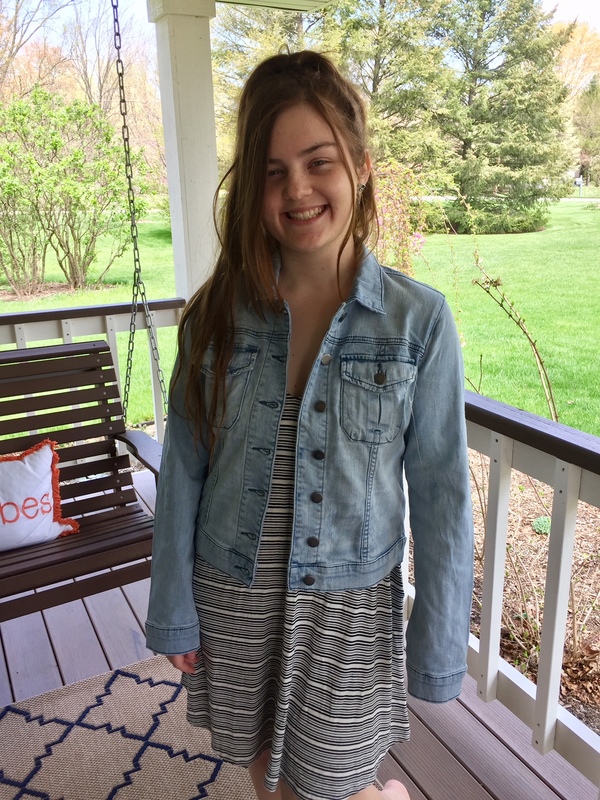 Piper (aka Lil’Mayhem) has been wanting to up her wardrobe game, and since I barely know how to dress myself, and I know a teenager does not want clothing advice from her mom (no matter how wise and awe-inspiring it may be), I set her up with a Stitch Fix. Once you click through the link, you will set up an account and build a profile by answering questions about your style preferences. You can also create a Pinterest board with samples of what you like, if you are into that sort of thing. Based on her profile, which indicated she liked casual, boho inspired clothing, this is one of the outfits they sent. Isn’t my little Gen Z hippie cute? 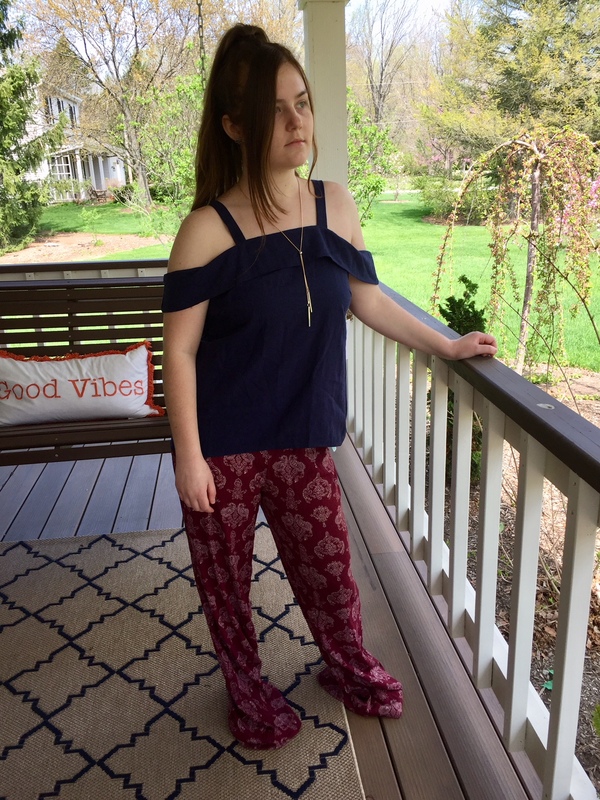 The top is called the Peasley Cold Shoulder Cotton Top (Collective Concepts), the necklace is the Knox Chain Lariat (Berry Jewelry) and the Margery Printed Wide Leg Pant (Boom Boom Jeans). Despite the pants being comically long, these items look perfect together, kudos to Kathryn the stylist who put the look together. She also received this adorable summer dress called the Joseline Knit Dress by Nine Britton. The fabric is really soft and heavy enough that the dress has a quality feel to it. Saving the best for last, she also got this Callie Denim Jacket by Kut from Kloth. The sleeves are a little long, but otherwise is looks fantastic on her. If you are like me, at this point you are saying, how much, right??? I am not going to lie, the prices are a little steep. As you can see, the total price before discounts is $252.00 which is a lot more than I would ever spend in one shopping trip. Once you apply discounts, the price drops to $144, which is $28 per item, that’s a little more reasonable. But those pants were a non-starter with her, so we’re not getting the 25% discount for buying everything. Decision Time. Here’s what she did, she kept the blue top which was her favorite piece. She also kept the dress because it was cute and reasonably priced. I talked her into keeping the jacket, it looks so good on her and she has already worn it at least 10 times. And, finally I bought the necklace because it is perfect and I love it. So bonus incentive to the Moms out there, if you do this for your daughter, you may also find something you love in that box. 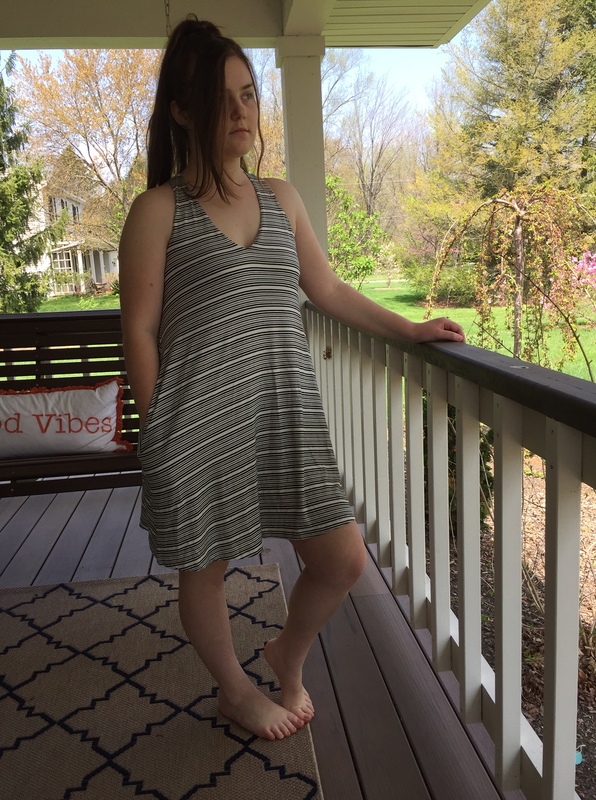 You can see she got $25 credit for using my referral link https://www.stitchfix.com/referral/12153084 which you are welcome to click through and use as well. 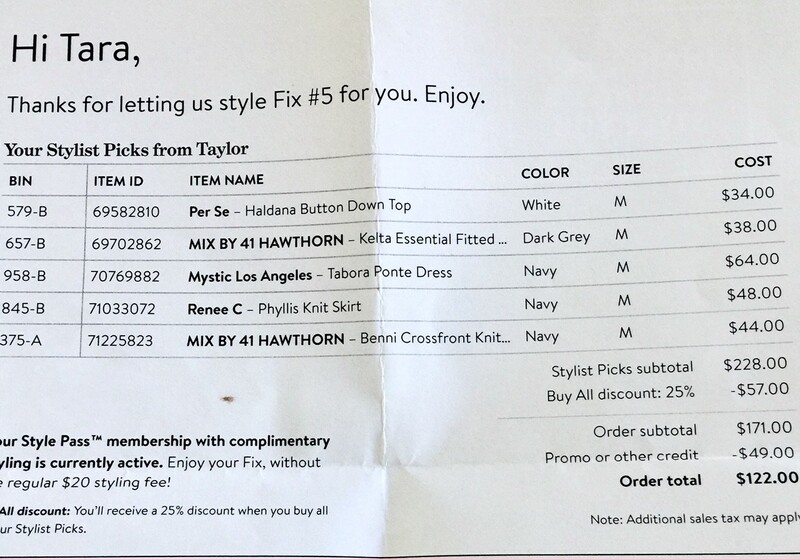 If you are going to give Stitch Fix a try you may as well start off with $25 in the bank. Once you schedule your first Fix you will get a referral code that you can share, and each time a person uses it, you get a $25 credit, pretty cool, eh? 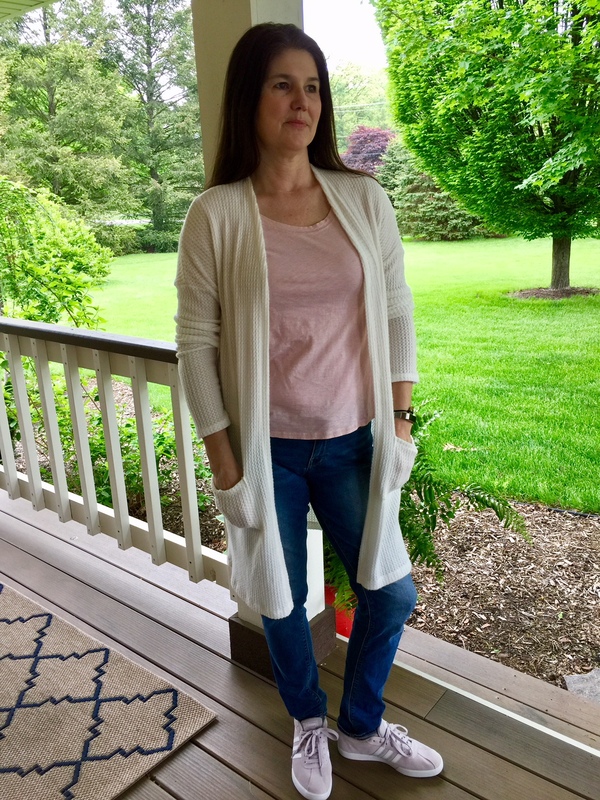 In the end, we had a really good experience with our mother daughter Stitch Fix and would highly recommend you try it at least once to see if it is right for you. Let me know how it goes in the comments.